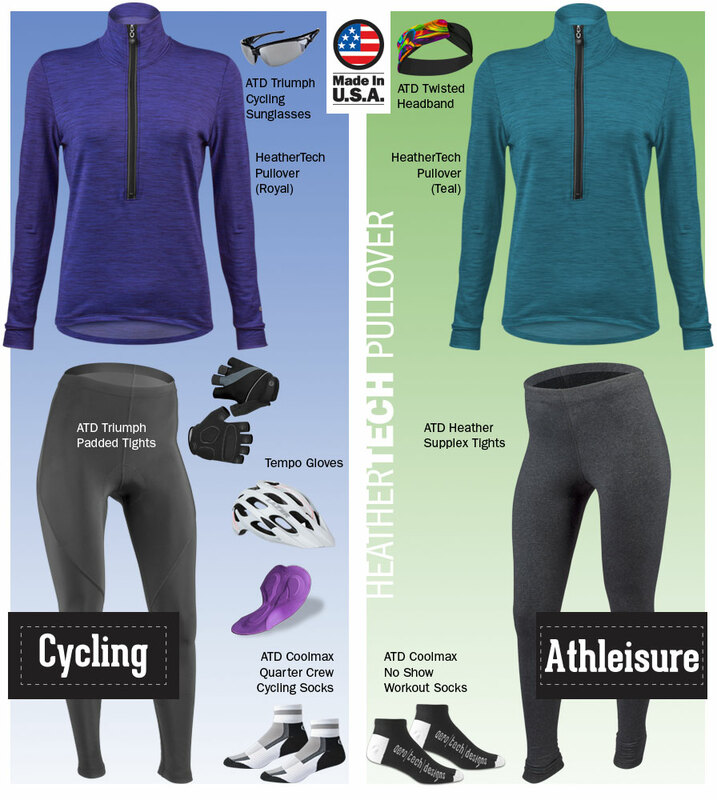 HeatherTech Fleece Cycling Pullover - Womens - Made in U.S.A. Specially designed with women in mind, this long-sleeve jersey will keep you warm while biking or walking to the coffee shop down the street. With its modern athleisure look, you can wear it everywhere! 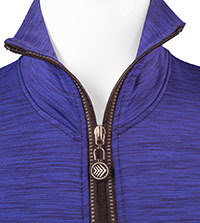 This is a quarter-zip pullover is made with a high performance polyester blend that wicks away sweat and moisture to keep you dry. The inside has a brushed fleece layer that is super soft to the touch and feels comfy-cozy warm. The princess lines along the front and back show off your feminine side, as well as slenderize for a trim fit. The pullover is wrinkle-free, so it's easy to pack for traveling cross-country or wearing after a trip to the gym. You can zip up the high collar to block out the blustery winter winds or wear it down for a more casual look. The cuffs offer some stretch for the possibility of additional layers without any elastic bands, yet still protect your arms from the cold. The zippered pocket on the back is easy to reach and has plenty of room for energy bars, gels, your phone or your music media player. A reflective tab is placed underneath for extra visibility on dreary days or night rides. The zippers on the front and back are also reflective! 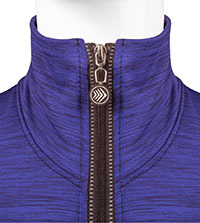 The HeatherTech Fleece pullover features jewel-toned colors that are fashionable and rich: rose quartz pink, royal sapphire blue and turquoise teal perfect for any cycling princess! With all the performance enhancements and versatility, you'll find any reason to wear it year-round. Wear collar up to block wind or down for a relaxed, casual look! 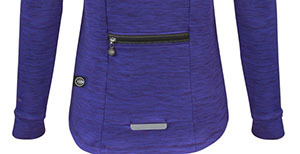 Zippered back pocket keeps belongings secure. 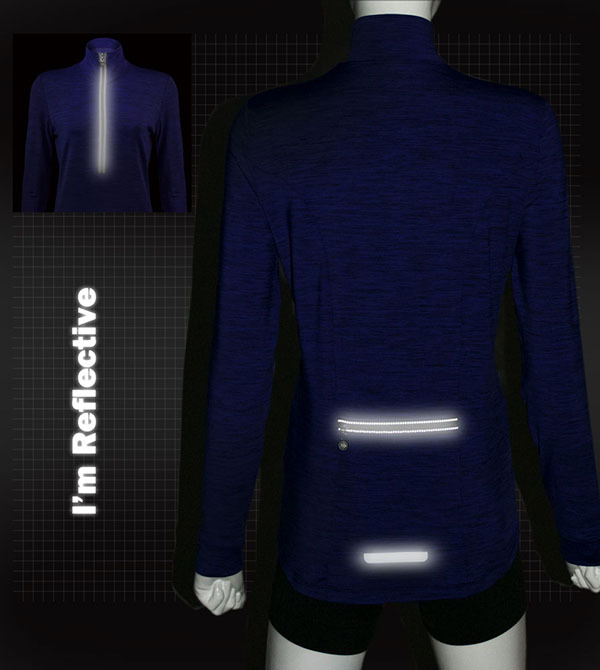 Reflective elements on front and back add safety at night. MAKE IT A KIT! YOU'LL BE GOOD TO GO! Really like this jersey. Has just the right amount of fleece (not too thick) that allows me to be comfortable with a long sleeve thin liner and an over shell in low 40 degree weather. Even though other reviewers said to size up a lot, I ended up with my usual xlarge (5'6" 158 lbs). Only "grip" is that there needs to be brighter colors like yellow or coral so one can be seen on the roads. Love this shirt! A 4 instead of a 5 because sleeves seem unusually long and the neck is a tad high. For those of you who order a 3x and get a garment that is skin tight, no fear here. I ordered a 4x thinking that might solve the tight problem. The 3x would have been fine. Long enough to cover tummy and hips. Warm enough to not need another layer on a 60ish day. Love the blue/purple but be sure you use your bike lights. I bought two of these and I am very happy with the fit. The arms are a bit long and the cuffs a little wide, but it still works for me. The material is very comfortable and the fit is just right. Not too tight but not baggy either. The description says this pullover is no challenge for Old Man Winter. No way is this pullover for the winter! The material has a very thin fleece lining and is more like Nike Dry Fit material than it is fleece. I live in the ADKs and wore this today on a ride in 60 degree weather with a thermal shirt underneath it. I was comfortable - not too hot and not too warm. I would say this pullover would be good down to temperatures in the mid-50's as long as you wear a base layer with it. The sizing is also off. After reading other reviews that the sizing is small, I went two sizes up and still found the pullover form fitting. I have an aerotech short sleeve jersey in XXL and it fits perfect. I bought a 3X pullover and it fits about right. If you are in need of a sharp looking pullover to wear on rides in the mid-50s and you order 2 -3 sizes larger than usual, then this top is very nice. Material is nice. Only complaint is that the arms are too loose & a little long compared to the overal fit of the jersey. Would have given this top 5 stars but the sleeves are a bit odd. They are a little long, which would be fine if they had thumb holes but they don't or if the cuffs were a little more fitted. Other than that I love the cut and fabric, that soft insides is SUPER nice. Thanks you for carrying clothes for active, large women! I both this to wear while jogging, I needed/wanted a place to put my car keys and phone. This top works great. This top was great for a cold-weather layer, just what I needed. I've worn this top in 30 degree temperatures had 1 undershirt beneath and stayed warm. Very well made with nice materials. Thanks to the well described size chart, it fit perfectly.